ICP, which is uniquely focused exclusively on ASX shareholder claims has commenced investigations into a shareholder claim against RCR Tomlinson Limited (Administrators Appointed) (RCR) in respect of continuous disclosure breaches and/or misleading and deceptive conduct. ICP has the assistance of forensic accountants and econometrics experts to review public information to assess whether there is a shareholder and/or auditor claim. 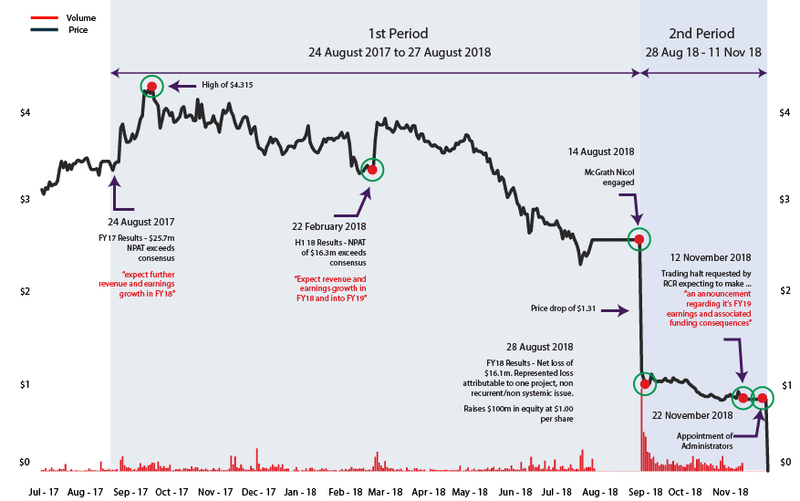 RCR subsequently raised $100 million to cover $57 million in writedowns on the Queensland solar farms (the Writedowns), inferring in its equity-raising prospectus that the procurement control issues experienced on the solar farms were not systemic within RCR. At the time, RCR’s interim CEO Bruce James advised the Australian Financial Review that the two solar farms were the only sites with a “circumvention of our procedures” and that there was “no fraud”. On 12 November 2018 RCR went into a trading halt and shortly after, administration. No further explanation has been provided to shareholders. We are likely to allege that RCR’s profitability and liquidity issues were not limited to the Writedowns. The going concern issues raised by Deloitte in its FY18 Audit opinion were not resolved by the equity raising and change to RCR’s debt facilities directly after disclosure of RCR’s FY18 results. Continuous disclosure breaches and/or misleading and deceptive conduct. Shareholders who acquired an interest in RCR shares traded on the ASX during the period 24 August 2017 to 11 November 2018 inclusive may be class members. We may seek trade data from back further, subject to the outcome of the investigations.